A 100-foot section of Salem Bridge, which carries Route 63 over the Naugatuck River collapsed early Tuesday, injuring a worker. NAUGATUCK — A worker for Southington-based Brunalli Construction was critically injured when a part of Salem Bridge, which spans the Naugatuck River, collapsed under his feet. The 100-foot section of the bridge fell before 7 a.m. Tuesday, closing through traffic on Route 63 and disrupting the commutes of thousands of drivers and Metro North riders. The section had been closed and under construction; no motorists or pedestrians were injured. The bridge is slated for a full replacement through the state Department of Transportation. 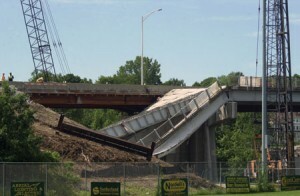 Traffic had previously been rerouted from the section that collapsed to a newly-built section, and workers would have eventually demolished the collapsed span, albeit in a controlled manner. The injured worker, who state police have yet to identify, had been operating an excavator with a pneumatic hammer attached, Department of Transportation spokesman Judd Everhart said, when he was alerted of the impending disaster and tried to make his way to safety. “It’s still unclear what he heard or felt,” Everhart said, “… but he was on his feet when the bridge collapsed.” Everhart added there was an engineer nearby, but that the man was the only person on the span of bridge that gave way. The man reportedly fell about 35 feet but was conscious and talking when he was taken to Waterbury Hospital. He was later flown by helicopter to Yale-New Haven Hospital; officials described his condition as critical, but stable on Tuesday afternoon. The $23 million bridge replacement project has been underway since 2008. Everhart said it was too early to speculate what Tuesday’s accident might cost, or how the project might be set back. 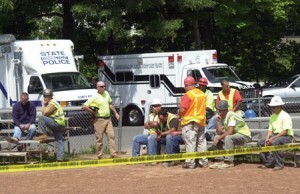 Workers stand by at Breen Field after the incident. Federal and state workplace safety officials were at the scene Tuesday, along with emergency responders, DOT inspectors and local officials, including Mayor Bob Mezzo. The federal Occupational Safety and Health Administration (OSHA) fined Brunalli $181,000 last April for 13 alleged “willful and serious” safety violations at another state bridge project in the Falls Village section of Canaan, Conn. An OSHA press release said the company had failed to protect workers against falls, drowning and puncture and laceration hazards at a project on Route 7. Those charges were settled at $140,000, said OSHA spokesman Ted Fitzgerald, who also noted that an inspector from OSHA’s Bridgeport office was on the scene. Brunalli is in the process of paying those fines. Everhart noted Brunalli construction is “very highly regarded,” and said the DOT has worked with the contactor on several projects. The bridge was closed to traffic until late Tuesday.